Third meeting of Greek and Turkish epigraphists will take place at the Archaeological Museum of Thessaloniki. The Archaeological Museum of Thessaloniki, the School of History-Archaeology of the Aristotle University of Thessaloniki and the School of Historical Studies if the Institute for Advanced Study of Princeton University organise the 3rd Greek-Turkish Epigraphical Symposium. The aim of this Symposium is to present the new unpublished Greek and Latin texts found in Greece and Asia Minor. 10.00 am-1.00 pm Museum visits. 4.00 pm-4.30 pm Welcome addresses. 4.30 pm-4.50 pm Dr. Tzeni Veleni, Archaeological Museum of Thessaloniki: Two inscriptions from the Hellenistic City of Petres in Florina. 4.50 pm-5.10 pm Dr. Yannis Kalliontzis, École Française d’Athènes: An Inventory List from the Sanctuary of Artemis Brauronia found in Oropos. 5.10 pm-5.30 pm Stergios Lioulias, Department of Antiquities of Emathia: A New Inventory from Beroea. 6.20 pm-6.40 pm Prof. Mustafa Adak, University of Antalya: Die Neoi und das Temenos des Dionysas. Eine hellenistische Pachturkunde aus Teos. 6.40 pm-7.00 pm Erkan Taşdelen, Hüseyin Uzunoğlu, University of Antalya: New Epigraphic Contribution to the City Walls of Teos. 10.00 am-10.20 am Prof. Mustafa H. Sayar, University of Istanbul: New Inscriptions from Kilikia Pedias. 10.20 am-10.40 am Dr. Mehmet Oktan, University of Antalya: New Votive Inscriptions from Nikomedeia. 10.40 am-11.00 am Dr. Bülent Öztürk, Mimar Sinan Fine Arts University: Inscribed Roman Lead Weights from the Territorium of Tios. 11.50 am-12.10 pm Dr. Elisavet P. Sioumpara, Head of the Program of Membra Disjecta, Service for the Restoration of the Acropolis Monuments (Y.S.M.A. ), Dr. Andronike Makres, Greek Epigrahic Society, Hellenic Education & Research Center (HERC): Inscriptions from the Acropolis of Athens. 12.10 pm-12.30 pm Dr. Nasos Themos, Elena Zavvou, Epigraphical Museum, Athens: New Research in Lakonian Epigraphy. 1.00 pm-4.00 pm Lunch and break. 4.00 pm-4.20 pm Dr. Argyroula Intzesiloglou, Department of Antiquities of Magnesia: Two Cretans in the City of Pherae, Thessaly, in the Early Hellenistic Period. 4.20 pm-4.40 pm Dr. Ioulia Katsadima, Department of Antiquities of Epirus: Notes on some late Archaic-early Classical Inscriptions from Ambrakia (Epirus). 5.20 pm-5.40 pm Prof. Pantelis Nigdelis, Pavlos Anagnostoudis, University of Thessaloniki: Epistatai reconsidered: A New Deed of Sale from Amphipolis. 5.40 pm-6.00 pm Dr. Domna Terzopoulou, Archaeological Museum of Thessaloniki: New Funerary Inscriptions from the Molyvoti Peninsula in Aegean Thrace. 6.00 pm-6.40 pm Chrysa Karadima, Department of Antiquities of Rodopi: New milestones from Aegean Thrace. 10.00 am-10.20 am Dr. Tolga Özhan, University of Çanakkale: New Agonistic Inscriptions from Smintheion. 10.20 am-10.40 am Prof. Manolis Voutiras, University of Thessaloniki: A further testimony for the cult of Isis in Kios (Gemlik). 10.40 am-11.00 am Çiğdem Şimşek, University of Istanbul: New Inscriptions from Aizanoi. 11.50 am-12.10 pm Özge Acar, University of Antalya: Epigram for a Gladiator from Kibyra. 12.10 pm-12.30 pm Dr. Burak Takmer, University of Antalya: New Inscriptions from Pisidia. 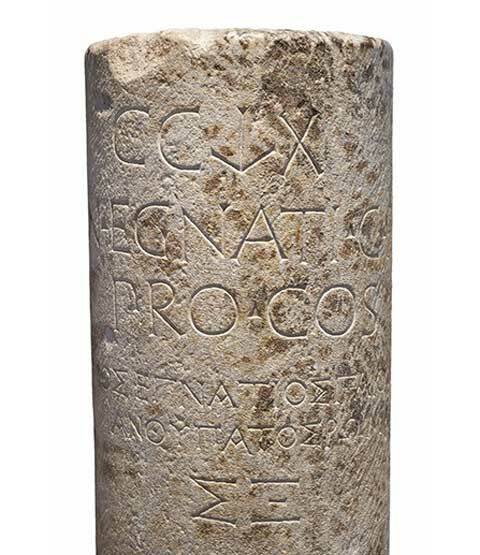 12.30 pm-12.50 pm Dr. Nikos Tsivikis: Γεώδης σἁρξ: Middle Byzantine Inscribed Sarcophagi from Amorium (10th-11th c. AD). 1.10 pm-4.00 pm Lunch and break. 4.00 pm-4.20 pm Dr. Ferit Baz, Mimar Sinan Fine Arts University: New Inscriptions from Cappadocia (Konana). 4.20 pm-4.40 pm Dr. Nihal Tüner Önen, Aykan Akçay, University of Antalya: Zur Nützlichkeit der Anwendung des RTI-Verfahrens für die Interpretation von drei Inschriften aus Lykien. 4.40 pm-5.00 pm Dr. Güray Ünver, University of Muğla: New inscriptions from Cnidus. 5.00 pm-5.20 pm Prof. Angelos Chaniotis, Institute for Advanced Study, Princeton: New Inscriptions from Aphrodisias. 9 am-4 pm Excursion to Dion and lunch.